Obach, a professor of sociology at the State University of New York at New Paltz, is a student of social movements who has also written about the labor and environmental movements. As any scholar would, he starts with a history of the organic movement, beginning with Jerome Irving Rodale and his concerns about synthetic fertilizers, already used in agriculture in 1942 when “Organic Farming and Gardening” was first published, and the proponents of natural and spiritual approaches to farming such as Albert Howard, Rudolf Steiner, Eve Balfour and Ralph Borsodi. Come the nineteen sixties and seventies, of course, the advent of Rachel Carson and Cesar Chavez’ indictment of agricultural chemicals and the growth of the counterculture seeking an alternative to a cor-rupt commercial society came together to create the back-to-the-land movement of food coops and communal farms. Organic sales, going from the insignificant output of a fringe movement in 1971, when NOFA began, to a still small but obviously growing market worth $1 billion in 1990, not only selected for hardworking and business oriented farmers but also was attracting the attention of outsiders. At first denouncing organics as a ‘food fad’ and threat to good nutrition, establishment figures such as Cornell’s Kenneth Beeson and Harvard’s Jean Mayer and Frederick Stare (whose self-interest in extensive ties to the food industry Obach neatly exposes) were quick to rail against the movement as ‘anti-science’. As time passed, however, distrust of agrichemicals continued to spread despite the exhortations of the leading academics, certification committees began springing up among non-profits, for-profits, and even state governments to set production standards, some organic companies found comfortable niches and started making serious money, and the sector as a whole became the fastest growing part of the food industry. At this point, Obach believes, three trends collided and, combined with the above signs of vitality, brought the eyes of the federal government to rest upon the or-ganic movement. First was the complexity of the organic marketplace. Natural foods retailers were building chains and brand products now and wanted consistency between the various certification programs. The biggest outlier was California Certified Organic Farmers (CCOF), which allowed transition to organic after only one year as opposed to the NOFAs and most other certifiers that required three years. Certifiers in Nebraska would not permit processors to use strawberries from Golden State soil just one year out of chemicals in tarts made with their 3-year Cornhusker wheat and call them ‘organic’. Second was the growing possibility of fraud upsetting the organic applecart. According to one report, at the end of the 1970s only 20 percent of organic growers were receiving a price premium for organic products. That changed in the 1980s, however, and success in getting better prices was attracting some unscrupulous actors. By 1989 almost 30 state governments had passed various organic legislation, but no means of enforcement, or funds to pay for it, were really available to the nascent industry. A 1988 case in which CCOF found a fraudulent operator, Pacific Organics, buying conventional carrots from Mexico and repackaging them as organic exposed the weakness of the private organic system. Finally, food scares were driving people to demand more organic food. The 1989 scare involving a report on the TV news program 60 Minutes that the plant growth regulator Alar, used to control apple ripening, was carcinogenic is perhaps the most well known such event. But it was emblematic of a sense that organic meant food safety and was clearly going to grow. The long and difficult story of the 1990 passage of the Organic Foods Production Act by Congress, and the many years which followed until the first organic regu-lations were released in 1997, is told in some detail. Grace Gershuny of NOFA Vermont played a central role in that process as a USDA staffer. 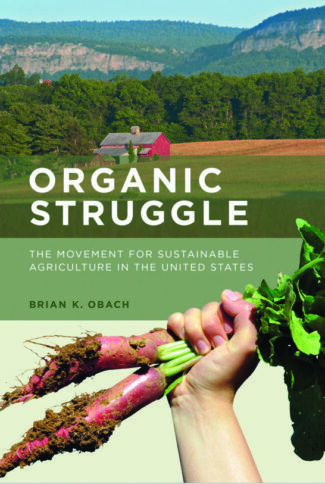 She has just re-leased a book, “Organic Radical”, that is being reviewed in this issue of The Natural Farmer by none other than Brian Obach. So I will refer the interested reader to that review for more during this period. use of genetic engineering (GMOs). The deep anger about these 3 clearly unacceptable proposals united the organic movement and resulted in our one big political victory. Over 275,000 comments from opponents flooded the USDA – the most ever received by a government agency on a proposed regulation to that point – and it was withdrawn. When an en-tirely new regulation was proposed in 2002, the big 3 practices were now prohibited. Obach continues the story up to the present, discussing the division among the two fundamentally different constituencies in the organic movement, which he calls the ‘spreaders’ and the ‘tillers’. By ‘spreader’ he means someone who sees organic agriculture as a more benign system and wants the supply of organic food to grow in the existing market. ‘Tillers’, on the other hand, hope to do more than replace a conventional commodity with an organic one. Spreaders tend to support lowering hard-to-meet standards so that there is a plentiful supply of organic food. Tillers tend to want to keep the standards high and pure and are willing to re-quire consumers to meet them halfway — forgoing “organic pop tarts”, if necessary, because certain coloring agents simply are not organic and should not be al-lowed. He writes of the various bumps in the road, including the Harvey case, Nathan Deal’s amendment, and various NOP and NOSB minutiae. I was surprised that he left out what was, to me, one of the most upsetting early developments — the case of the Organic Hen, the Massachusetts egg producer denied certification in 2002 by NOFA/Mass for not providing outdoor access for its birds, which immediately appealed to the NOP and won a legal case establishing that certifiers are agents of the federal government and thus subject to its decisions. For someone interested in a good history of the organic movement, and particularly the history of organic certification in the US, this will be a satisfying book. Many names familiar to NOFA members will be featured, particularly those in Obach’s stomping grounds of eastern New York and Vermont. He also touches on the growth of the Organic Consumers Association, the Agricultural Justice Project, the Domestic Fair Trade Association, the National Organic Coalition, the Or-ganic Trade Association, the Farmer’s Pledge, Certified Naturally Grown, and of course several NOFA chapters. I myself hope he is not yet tired of delving into the organic movement. I am sure there is a sequel here which will be as full of hope and struggle as the period he has already covered. Sunset Policy, Organic Hydroponics, Social Justice, and Carbon Farming are just a few of the issues of our day which I am sure will find themselves fought out, at least partly, in this venue!